Dentin, the material that composes the bulk of teeth in most vertebrates is a complex mulit-level composite. It is composed of different volume fractions of ceramic (calcium hydroxyapatite, HAP), protein (mostly collagen) and water. These three phases create the basic building block of bone and teeth: the mineralized collagen fibril. Collagen, a triple helical protein, self-organizes into bundles called fibrils. These fibrils are well organized and contain regularly spaced regions of high and low protein density called the overlap and gap zones respectively. The HAP crystals are believed to then grow within these gap zones reinforcing the weak collagen structure. In dentin, these mineralized collagen fibrils are then further organized around long hollow cylinders called tubules. These tubules span the thickness of dentin, from the pulpal cavity to the surface of the dentin and are surrounded by a highly mineralized ring of Hydroxyapatite called peritubular dentin (PTD). The mineralized collagen fibrils are then organized tangentially to the surface of the PTD creating the intertubular dentin (IDT). This complex structure allows dentin to be tough and strong, thus maintaining the structural integrity of teeth. Although the remarkable mechanical properties of dentin have been previously investigated on a macroscopic and even microscopic scale, I am interested in knowing what happens at the most basic level: within the collagen fibrils. In order to determine the role of the HAP crystallites and the protein in the fibrils, I use high energy x-ray diffraction to determine inter-phase load transfer and texture under different types of loading. In this process, a high energy monochromatic x-ray beam is sent through the sample. 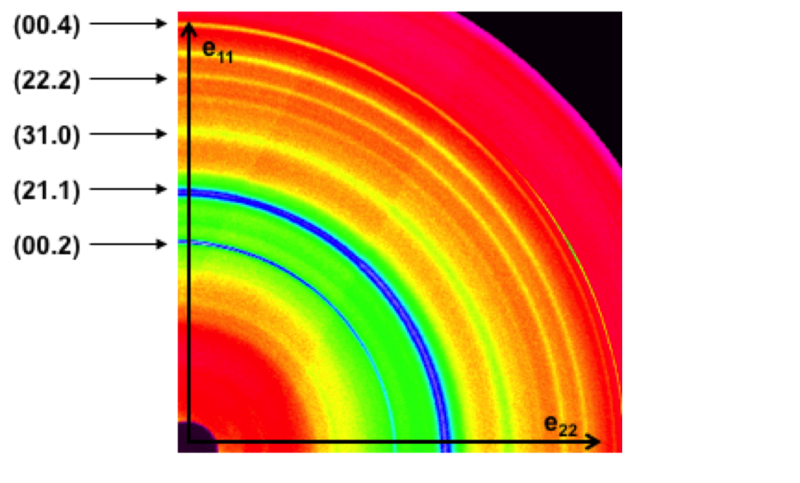 As it travels through the dentin specimen, the x-rays interact with regularly spaced planes and are diffracted at specific diffraction angles producing corresponding diffraction rings. The angle at which the x-rays are diffracted provides information about the spacing between the diffracting planes. By looking at large angles (wide angle x-ray scattering, WAXS), small spacing such as the lattice spacing within the HAP crystals can be measured. Similarly, by examining x-rays diffracted at small angles (small angle x-ray scattering, SAXS), large spacing such as the spacing between HAP crystals in the gaps zones can be measured. By measuring the change in HAP lattice spacing and fibrillar spacing from the diffraction rings under varied loading conditions, I am able to determine how the different phases of dentin deform with applied stress. I have done these measurements under a number of different environments and loading schemes in order to clarify how the collagen and HAP crystals behave under different conditions. During initial tests on root dentin cylinders under increasing compressive loads, I was interested in seeing if loads were successfully transferred between the HAP and collagen phases and how this behavior varied with location in the dentin. I examined the load transfer behavior by calculating an apparent modulus, defined as the ratio of applied stress to lattice strain, for each phase. I found that apparent modulus values varied greatly with location within a tooth but that average values were 27 GPa for the HAP and 15 GPa for the fibrils in dentin. These are respectively lower and higher than the Young's moduli measured for each pure phase. This is evidence that load is being transferred from the collagen to the HAP, allowing the collagen to carry less stress, and therefore less strain and a higher apparent modulus, while the HAP carries more stress, and therefore more strain and a lower apparent modulus than their respective pure phases. I then pushed the research further, investigating how the load transfer behavior was affected under high constant stress, creep load conditions. I found that under biological conditions (hydrated and body temperature) the strain on the HAP lattice continued to increase with increasing time under load. This suggests that load transfer is also occurring under this constant stress loading scheme. I am now investigating, in collaboration with my lab mates Anjali Singhal and Fang Yuan, the role that different environments may have on load transfer behavior. FIGURE 1: Schematic of the hierarchical structure of teeth starting with the whole tooth molar (far left). Followed by the tubules surrounded by peritubular dentin (PTD) and intertubular dentin (ITD). This ITD is further composed of tangential mineralized collagen fibrils which are themselves hydroxyapatite and collagen composites (far right). FIGURE 2: Example of a high-energy wide angle x-ray diffraction pattern for dentin. 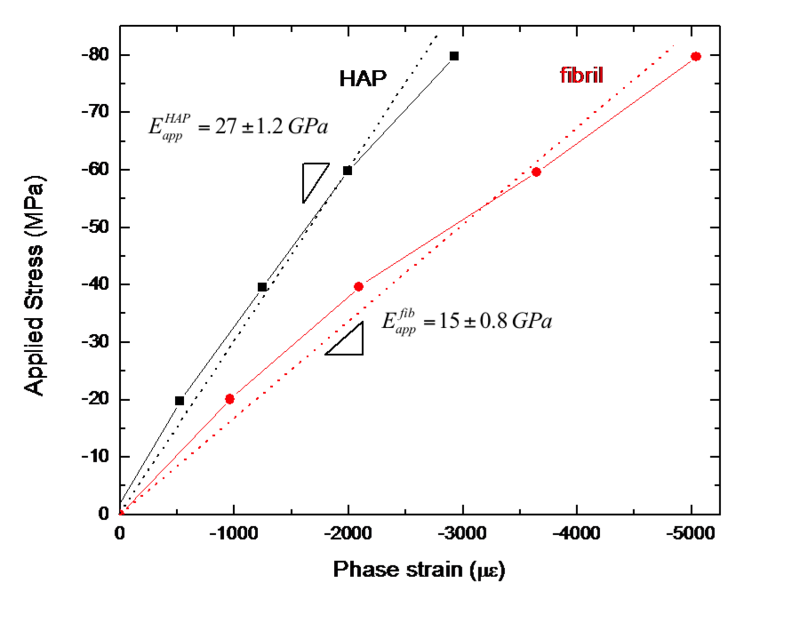 FIGURE 3: Plot of applied stress versus Phase strain for the HAP and the fibrils. The slopes are taken as the apparent applied moduli. This research was performed at station 1-ID of XOR-APS at the Advanced Photon Source which is supported by the U.S. Department of Energy, Office of Science, under Contract No. DE-AC02-06CH11357.